There was never a better time to be knowledgeable about security and privacy, and while, despite what you hear in the media, physical security has increased throughout the world, the dangers for our internet security and online privacy have never been greater. While a mugger in a dark alley might let you choose between your money or your life, giant corporations, AI information farms, identity thieves, and some governments as well will prefer if they were to take both. Another sad fact is that if any of these entities know who you are and can form a complete picture from your information, it is not likely that you will be able to protect yourself from more intrusive attacks. Your IP address is connected to your MAC address, which is connected to your internet service provider. That ISP sends you a bill in your name every month either to your home address or directly to your credit card. This paints a nice picture of how with a little bit of information your whole life could be unraveled by someone who has the means to do it. The only actual defense is not to let anyone know your IP address and to be exceptionally scarce with your personal information on social media and other websites. To mask your IP, you can either use just a proxy server that will hide the IP of one of the applications you use or to use a VPN that will transfer all of the data from your ISP router through the servers of the VPN provider. While similar on the first glance, these two services are not the same, mainly because even the best proxy server is usually just the single server, while premium VPN providers such as Le VPN have hundreds of servers in 114 countries around the world. A virtual private network is a range of off-site servers that encrypt and route all of the data from the router provided by your ISP through that server, masking your IP towards third-party locations such as websites, but also other users if you are connecting P2P because of torrenting or other activities. 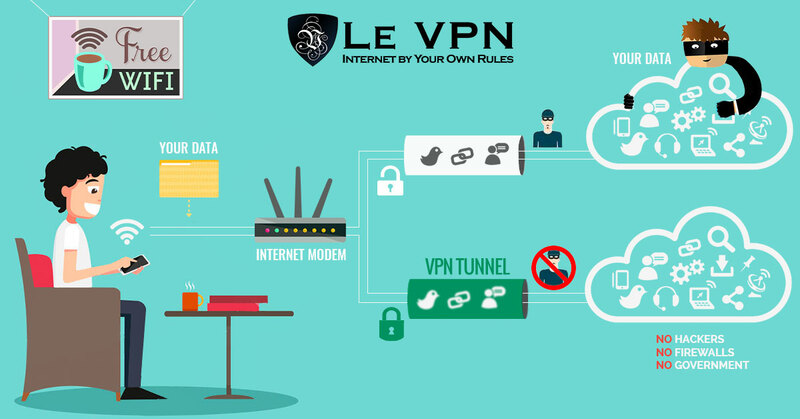 If you will know how to use a VPN depends on the provider, and while this might be the least of the advantages given by premium VPN providers in comparison to free services, premium VPN services like those from Le VPN include a user friendly app where you can connect to different servers around the world and change that connection in a matter of seconds. Additionally, as your connection is encrypted within a tunnel between your device and the VPN server, your data will not be usable even if it is intercepted or redirected in some way. The information you send and receive will only be visible to your devices, as well as the modem translating than inside the server, which is not approachable as to be tempered with. This should not be mistaken for a Virtual Private Server that is basically a cloud-based server most companies use to operate remotely. If you were to place an analogy comparing VPN vs. VPS, it would be like comparing a guard protecting your fortune at home to a banker keeping it somewhere else. VPNs are quite a bit safer, but VPS machines do not endanger your other assets if they fall. A Proxy connection, or an intermediary connection, is done by connecting one of the apps on your device to a server that is somewhere else, as to mask the IP address of that particular program. Depending on the quality of the server and the number of users connected, the speed of a proxy connection might vary. The use of proxy servers is usually free, and almost always cheaper than the use of premium VPN providers. This being said, even the best of proxy servers are typically made by internet enthusiasts and not by groups of well-paid engineers. While they can be quite fast and quite safe upon starting, keeping the server operating under more stress is costly and time-consuming, making the server deteriorate in time. Additionally, if the proxy server fails for any reason, or just goes off-line for regular maintenance, you will not be able to establish the connection for that time. Finally, a proxy connection can deal with a limited number of applications at a time and is best suited for specific jobs, such as P2P programs like Vuze or uTorrent. You will not be able to connect multiple devices and multiple applications to the same proxy without sacrificing a lot of internet speed. This is similar to making a choice if you want to give your personal information directly to the criminals, or would you prefer to give them to a sock puppet company, that will provide that information to a large corporation, who will sell them to criminals? Both choices are abysmal and can generally be regarded as less safe than just using your ISP router, as at least you are not going directly to people who are collecting data. Free proxy servers are usually just sophisticated MITM (Man in the Middle) hacking attempts where a server will pop out, use a bot farm to advance on Google ranking, and then start collecting information from all the people who connect through it thinking that they are safe. Free VPN might look prettier but is not much better. As we have seen with a recent scandal by a free VPN made by Facebook, these types of connections are neither safe and are usually not even real VPN connections. Although the Onion Router Browser or TOR Browser is a fascinating concept and a truly marvelous piece of open-source software, it is not the most secure way of connecting your computer, as there are still people who will have your IP address, even if they don’t know that it is you, yet. Unlike a VPN that will route your data through very powerful encryption protocols, TOR will just use a vast number of interconnecting devices to jump your connection through all of them. While this might make you much harder to find, this would only be if someone doesn’t know any other information about you. With massive IP filters you may pinpoint the origin of a TOR connection, and then use that connection as an entry point for data theft. When you know that both of these services do, you may compare them side to side, which is probably the best way to see what you need. For comparison, we are presuming that you are using a premium service for both a proxy connection and a VPN. Those that are tech-savvy usually don’t have a problem with protecting their devices, but not everyone has the time to acquire an IT degree and closely calibrate their system and their protection. 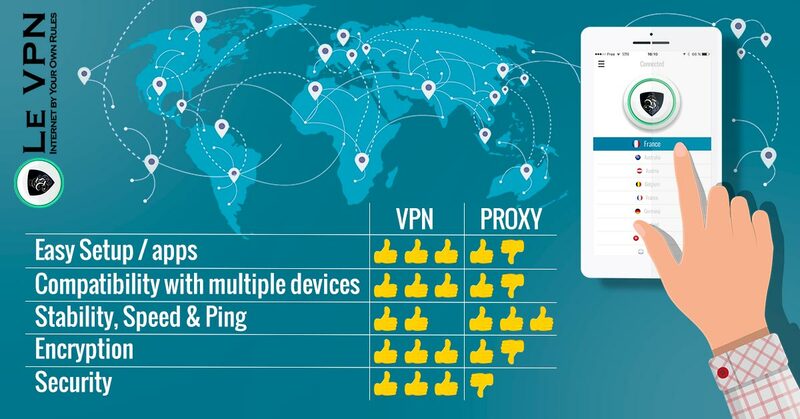 This is an analysis on how VPN and proxy connections are compared to each other once you first start them up and how easy they are to start using. For the top range proxy servers, you will have presets to link the proxy to the app that you want to use, and most of it will be easy. You will need some technical knowledge, but nothing major. If you only have a single app to connect with, a proxy connection will be a cheaper option. But if you are connecting a device that you use for work, banking, or personal browsing, you will need a VPN connection. With the rise of the smartphones, most of us have multiple devices that we use on a daily basis, and those devices usually use various platforms like Windows, MacOS, iOS, Android, or Linux. Not all connections are possible with all platforms and gadgets, and you will need to know that before you attempt to set up a connection. While a single proxy connection will be optimized for a single platform, you may find different servers that are calibrated for different systems and connect specific devices to these servers. Regardless of the operating system that you use, you will probably find a reliable proxy server for your needs. If you have a single device and a single platform, using a proxy might be simpler, but if you use the same modem to connect multiple devices, like smartphones, laptops, and even printers, you will need a VPN connection that will support all that diversity. Once you have established your connection, you will want to keep it. Additionally, it would be nice to have a decent download speed and ping, as well as to be certain that if the connection fails we will not be unknowingly reconnected to our regular ISP router. Proxy connections are usually concentrated in larger hubs in the northern hemisphere, meaning that you will often have one quite near to your location, which makes for better stability. If you are using a single app, you may configure the connection to cut off if it becomes unsafe and make the connection much more stable, if not as fast overall. With the risk of sounding like a cop-out, this depends on your use. While a VPN is a more reliable option overall, there might be cases where you will want to connect to servers across the world as to bypass any restrictions which will make the VPN lag more than a proxy connected for P2P that is relatively near you will. Measuring how good and how secure is the encryption used by a connection, which will determine how safe your internet is. There are different types of encodings and protocols, and these will work differently in environments such are virtual private networks than in singular or multiple proxy connections. A VPN will use a tunnel to encrypt your connection in two places, making it virtually impossible for anyone outside the network to access any data that is being sent. These tunnels can have various approaches to encrypting your data, but usually, have multiple encryptions on top of each other. This is not a problem for your devices and the server as the actual amount of data needed to decode the encryption is quite small, but to break all of the combinations one will need processing power higher than anything that actually exists on this planet at this time. Proxy connections will use a SOCKS handshake protocols to secure your connection and to make it more diversified with the SOCKS5 proxy connections more common in proxy networks such as the TOR Browser. The links will have an SSH tunnel, which is relatively secure, but not even near to the level of a VPN. A VPN here is just better, in all cases. This, by all means, doesn’t suggest that a proxy connection cannot be safe, but rather that as you increase the levels of encryptions on a SOCKS proxy, you will witness a downgrade in speed and utility, while with a VPN you will not. Probably the most important question. For this point, we must presume that you are using the best possible proxy connection, or a reputable premium VPN, excluding the possibility of human error or technical insufficiency. How safe will you be by using either service and how big is the probability that your information will be compromised. The proxy connection itself is safe, and there are SOCKS5 proxy servers with multiple firewalls that are almost impenetrable, with “almost” being the operative word. Proxy servers will guard only one application at a time, and which means that people can use the meta-data from your other programs, especially OS such as Windows or MacOS, to null the benefits of the proxy. For smartphones that have ‘’always online” applications, these types of connections can be quite unsafe. As this point is very closely related to the encryption, it is not strange that the results are similar. A proxy connection might be useful and safe for specific purposes, but it is a very fine line that a regular user will cross very often. A very obvious proof for this is that you can bypass proxy servers by using VPN technology, as to mask the request sent by your device. In the same manner, a hacker can use a LOIC to bombard the proxy server from multiple sides until it breaks, and with just one server working it is impossible to turn off the server, as that would disconnect all of the users. Not wanting to sound mean, a proxy server is to a VPN as what Microsoft Internet Explorer is to Chrome, the best way to download it. Jokes aside, a proxy connection is a very valuable tool if you do not have access to a premium VPN, as a well done professional proxy is still better than a free VPN, but it can never compete with a premium VPN connection that has global server coverage, multiple encryptions, and redundant security measures. In both cases, you will want to strive to get the best possible service. As a short-term solution for a device that is still not filled with your private information, you may feel free to use a proxy connection, but you should plan for a premium VPN such as Le VPN that will provide you with safety for all of your devices, all the time, for all platforms.